May I call you Braeden? I don’t know you from a hole in the ground but you call me “Paul”. Such is our age of phony informality. So,the prize for a donation to the Liberal Party is a chance to join Justin in prancing in the Gay Pride Parade. I, for one, am sick and tired of minority privilege. No way! Those who have to parade their sexuality — some buck naked — are neurotic and a disgrace. Justin Trudeau demeans his office by joining such a parade. The apology to the Sikhs for the Komagata Maru incident –a ship of mostly illegals and revolutionaries, quite rightly expelled by the Dominion Government in 1914 — shows that Trudeau has made his choice. He favours Sikhs, Moslems, the transgendered and the sexually diverse. OK, he’s the prime minister of the privileged minorities. He is not mine. We need a Prime Minister to represent the dispossessed Canadian Majority. Be warned, Traditional Canadians won’t take this pandering much more. Now, Mr. Trudeau wants to trample on free speech. He wants to define criticism of the transgendered as “hate speech” which could earn the victim up to two years in jail. In politically correct speak it’s just not “appropriate”. Can you believe that no sitting Canadian Prime Minister has ever marched in a Pride Parade? Until July 3, 2016 that is — when Justin Trudeau will make history and become the first. When hundreds of thousands of Canadians join the PM that day to show support for LGBTQ2 rights and equality in the Toronto Pride Parade, the Liberal Team will be marching right alongside them. But we are also going one step further, and giving you the chance to make history with us! 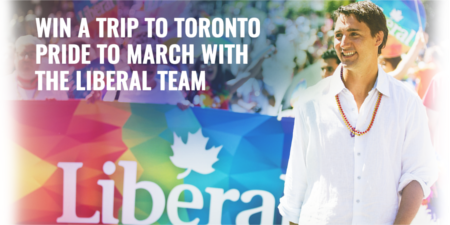 We’ll be flying one lucky supporter and their guest to Toronto, airfare and hotel on us, giving you each VIP passes to the Toronto Pride Festival — and inviting you to march with the Liberal Team in Sunday’s parade. Already want to be there? Donate now and then follow the link to enter the promotion. It’s going to be an extraordinary experience and an unforgettable moment for Canada’s LGBTQ2 community, and you’ll be a part of it! The promotion is free to enter and anyone can sign up on Liberal.ca. But we’re also up against a steep fundraising target this month with $200,000 to raise to stay on track with our second quarter fundraising goal. The Conservatives — without a permanent leader — raised over $1-million more than we did in the first quarter. We can’t let that happen again, which is why it’s so important you chip in to help us close the gap this month. While the Conservatives are still debating whether or not to even support equal marriage (note: it’s 2016), Justin Trudeau and the Liberal government have announced bold new steps to protect the rights, safety, and inclusion of transgender Canadians – and that crucial progress must continue. Join the over 700 Canadians who have already donated $25,192 this month — donate now and then follow the link for the chance to come march with us in Toronto. If you’ve saved your payment information, your donation will be processed immediately. There has never been a better time to make your first gift to the Liberal Party of Canada. A gift of any amount makes an incredible difference in our work to help build a stronger, more inclusive country.